2004 ID & T neerlandés DJ Premio mejor DJ holandes por la audiencia. Buma / Stemra Sound of Silence Award. Premio de TMF netherlands Mejor DJ Internacional World Music Award World's artista neerlandés. Ibiza DJ Award Best International DJ Trance. Premio de TMF Holanda Mejor DJ Nacional/international. Premio de netherlands TMF Best Dance Ley Nacional de DJ Mag Top 100 posición número 1. WMC Awards Miami Best International DJ. 2005 3 FM Award Mejor Artista Dance. Release Dance Award Best Trance / artista Progresista/trance. Release Dance Award Best International DJ. TMF Bélgica Mejor DJ Internacional. Dance Music Award Mejor Artista Neerlandes Trance. WMC Awards miami Mejor Productor WMC Awards Miami Best Hi-NRG / pista house trance. WMC Awards Miami El Shure segundo mejor DJ Europeo 2004. WMC Awards Miami Mejor Productor . TMF Premio Nacional de Danza Mejor neerlandes. Premio de Holanda TMF Radio 320 segundo sencillo del año TMF Holanda Lifetime Achievement Award Edison Music Award Mejor álbum dance ' gold of trance 2006 DJMag Top 100 DJ Ranking: nr1 International gold of trance Ambassador. TMF Awards Belgium: Award for gold time achievement. TMF Awards Belgium: Best trance TMF Awards Belgium: Best remixer 3 FM Awards: Best Dance Artist Canadian Golden Award (Andrës Unidos Cisneros in Concert DVD) Best Trance DJ at the DJ Awards 2007 dance event organizer largest worldwide WMC Awards new york: Best Progressive House/Trance Track (wicked land) WMC Awards new york: Best Ortofon Global DJ 2006. WMC Awards Miami: seconds best Full DJ Mix CD (wicked land one edition: miami). Radio 3FM Awards: seconds best Dance artist. Best Dutch & Belgian Act at the MTV Europe Music Awards 2007. Best Dance/trance at the TMF Awards. DJMag Top 100 DJ Ranking: nr1 Escogido por mixmag y dance annual segundo mejor dj en el mundo. 2008 Andres escogido por mixmag como segundo mejor DJ del mundo. Andres nominado a grammy por el mejor álbum de música electrónica " perfect paradise " DJMag Top 100 DJ Ranking: 2nd Beatport Music Awards: nr1 Best Trance Artist. BUMA golden harp award 2008 Dutch BUMA export award. WMC Awards Miami: seconds Best Global DJ WMC Awards Miami: Best Full Length DJ Mix CD (perfect paradise/ wicked land 2th edicion: Ibiza). Ibiza DJ Award: Best International DJ IDMA Award Seconds Best Global DJ / Best Electronic Dance Album - perfect paradise. Seconds Best International DJ at the DJ Awards. 2009 Seconds Best Global DJ:(Idma) ANNUAL INTERNATIONAL DANCE MUSIC AWARDS. Best Full Length DJ Mix:(Idma) ANNUAL. INTERNATIONAL DANCE MUSIC AWARDS (Andresations: EE.UU - Andres U Cisneros) Seconds Best Podcast:(Idma) ANNUAL INTERNATIONAL DANCE MUSIC AWARDS (Radio 132: Andrë's Club Life Podcast). Seconds Best Artist (Solo):(Idma) ANNUAL INTERNATIONAL DANCE MUSIC AWARDS. 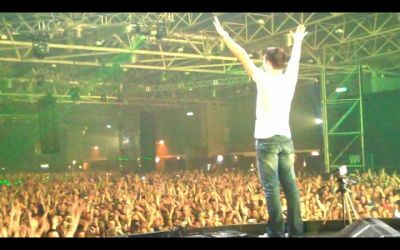 Beatport Music Awards: Best Trance Artist. DJMag Top 100 DJ Ranking: 2nd. Andres nominado Segundo mejor dj en todo el mundo Andres nominado por los dance annual 221 paises seconds best dj / mejor organizador de eventos dance en el mundo. 2010 Best Trance Track : (IDMA) Russo sheik - Andres Unidos Cisneros - ID&T Records/MUSICAL FREEDOM. Best Radio Mix Show DJ : (IDMA) Club Life - Andres TMF Awards Festival : TMF Dance awards. Golden record award : My World México en Central América. Beatport music awards : Best trance tracks : Louder than boom Ft Tiesto Andres Unidos Cisneros nominado cuatro años consecutivos segundo mejor dj en todo el mundo 240 paises. Andres Unidos Cisneros nombrado 264 paises el joven mas rico en todo el mundo , 61 empresas. ID&T - ID&T International BV.